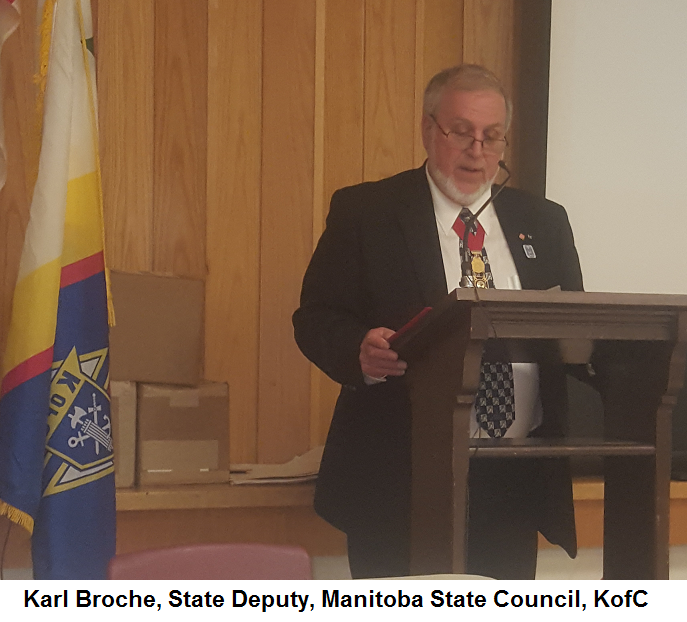 The Knights of Columbus of Manitoba State Council held the installation of their officers with a two-day event of prayer, seminars and celebration. These events were held at Holy Eucharist Ukrainian Catholic church and auditorium in East Kildonan. 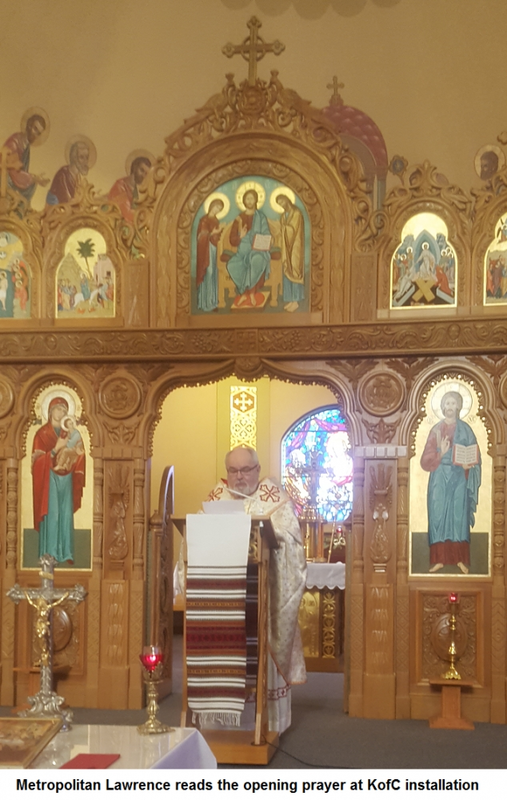 The program opened with a Friday evening Divine Liturgy celebrated on 8 July by the 2016-2017 Honorary State Chaplain, the Archbishop of Winnipeg, Metropolitan Lawrence Huculak, OSBM. The concelebrating clergy were newly appointed State Chaplain Rev. Dr. Michael Kwiatkowski and Rev. Fr. Edward Kwiatkowski who has served as Chaplain for councils in Manitoba and British Columbia. Metropolitan Lawrence preached a homily on the Lord’s commissioning of the Apostles found in the 10th Chapter of the Gospel of Matthew. He spoke of the challenges of our times while encouraging the newly commissioned officers to fulfil their duties with faith and confidence in the Lord Who is among us. Following the Eucharistic liturgy, State Deputy Karl Broche presided at the ceremony of the Installation of Officers for all Manitoba. The Knights were dressed in the robes of their office as members of the State Council or as District Deputies. They were accompanied by their wives who were invited to participate in the first evening’s events. It was an inspiring event as the officers made their oaths and then, accompanied by their spouses came forward to receive the insignia of their office. Archbishop Lawrence opened and concluded the ceremony with a prayer of blessing. Following the events in the church, everyone moved to the lower level for a banquet and an evening of formality and entertainment. Following the excellent dinner, State Deputy K. Broche issued certificates of recognition to many of the people present for reason of the office they accepted or for service that they have already rendered to the Order. The theme that he promoted and which was emblazoned at the top of each certificate was Pope Francis’ call that we “Go out to the peripheries”. The State Deputy explained that this meant reaching out to those in need – not only with material assistance, but perhaps especially seeking out those in need of spiritual aid and companionship and love. The evening concluded with some fun in the form of game challenges and prizes. On the following morning the newly installed officers gathered bright and early for a long full day of informational seminars, workshops and discussions all directed by the State Deputy, but with the participation of many speakers. The Knights of Columbus of the many Manitoba Councils have a great deal of amazing projects and plans to extend the work of the Order and the mission of the Church to many areas where they will do immense good. God willing, by the cooperation of many around the province, they will realize all their plans to contribute to the betterment of our society for all people of good will.